To undo or redo your last action, there are Undo and Redo buttons in the top-right corner next to the Save button. To copy an existing field, click on the field, and then select copy this field from the options sidebar. You may also drag and drop elements within the Form Builder or in the outline view. The editing toolbar, also known as the floating toolbar, will appear when a field is selected in the Form Builder. 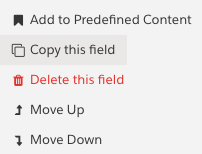 It's a quick way to modify your fields. The toolbar allows you to style the field label bold, italic, or underline. You can choose to style selected text, or highlight the entire label. You can also mark the field as required or delete the field. For text elements, you can also add an image, a link, or clear out any formatting if the field label was pasted from another document. The Options button will open the sidebar to edit the field properties. To modify field properties, click on the field and choose Options from the editing toolbar. 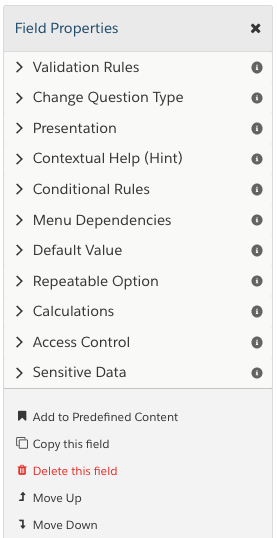 With the sidebar, you can change the question type, add validation rules and conditional logic, and use other advanced features. When you add a text field to your form, the paragraph editing toolbar will appear whenever you are editing that field. The bold, italic, and underline options formats your text as labeled. The image option will insert an image into your text. On click, the Form Builder will prompt you to choose a file from your computer to upload. The link option will create a hyperlink within your text. Highlight the text you would like to hyperlink and click the link option to insert a URL. The clear option will clear any formatting. This is useful if you are copying and pasting in text. The alignment options aligns your text left, center, or right, respectively. The indent option indents your text to the left or right. The list option creates a bulleted or numbered list. The HTML option opens up the HTML code for the paragraph. The delete option will remove the text field.